Under the lead of TU Austria, we organize an Alpbach Breakout Session on Cyber-Security as a fundamental right. Participants include Isao Echizen (NII), Lokke Moerel (Tilburg University), Günter Müller (University of Freiburg), Reinhard Posch (TU Graz), Bart Preneel (University of Leuven), A Min Tjoa (TU Wien), and Edgar Weippl (TU Wien, SBA Research). Klaus Krapfenbauer, one of SBA’s bright students, successfully finished his Winter of Security project at Mozilla. As part of his master thesis he implemented a PoC for fully automated Let’s Encrypt support in nginx. Due to the design of nginx, this was not a straight forward task. You can read the technical details in the blogpost from Mozilla. If you are interested in participating in this year’s Winter of Security, please contact Martin Schmiedecker. 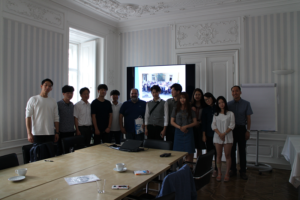 Students from the Changwon National University of South Korea visited SBA Research. Adrian Dabrowski talking at the “#heiseshow” about the finale of the Cyber Grand Challenge, the world´s first all-machine hacking tournament, which took place at the DefCon 2016 conference. The full article/ show can also be at heise online or YouTube. Members of SBA will be present at USENIX Security and co-located workshops like WOOT or FOCI to cover them for our PRIME partner program. If you run into them, don’t be shy to say hi. Sebastian and Martin will present two research papers at DFRWS USA, the leading conference in digital forensics. The first one is on using nano-second timestamps for embedding steganographic information securely, titled “Time is on my side: Steganography in filesystem metadata”. You can find a preprint of the paper, the data and the source codes online. The second paper improves the forensic process by leveraging sub-file hashes part of the Torrent filesharing protocol, “PeekaTorrent: Leveraging P2P Hash Values for Digital Forensics”. Preprint, data and source codes can be found here.